My oldest son (who really is my step-son, but we've been part of a family for almost 12 years so I consider him mine :) is 13 and really doesn't like peanut butter. I mean, what kid doesn't like peanut butter? (besides the ones with allergies to the stuff). So I introduced him to Nutella. Guess what? It's his new favorite thing. I made him a Nutella and sliced banana sandwich and he thought it was the best thing ever. It's pretty easy to make a kid happy. I can't believe the month is gone! I really need to take some time to prepare a new meal plan. I'll post it next Sunday. 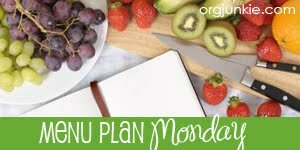 Be sure to visit Organizing Junkie for more meal plans. It seems like everyone is talking about that Nutella stuff... guess I will have to pick up some to try! Looks like you have a good week of meals planned. I thought I'd share with you this pizza recipe that I recently tried -- I couldn't remember if you did one similar to this or not, since I know you do so many pizzas!! I tried it and it was really good. Have a great week! We like Nutella here to, especially my 13 yo daughter. She eats it by the spoonful if I let her. Your granola bars look good, I'll have to try them next week. Oh yum nutella, I love that stuff also, my fave is to spread it on a flour tortilla, I know it sounds gross, but I love it!